The Executioner Demon, a naturally armored opponent with blades instead of forearms and hands. They are deadly combatants and tenacious foes. What could be more terrifying than a Hellwyrm, a dragon native to the demonic realm? The Low One demon, a tentacled blob, is born of the lowest form of damned souls. Near mindless, these creatures just want to eat everything in sight, including your character. The Mistress of Pain uses her barbed chains to torture and interrogate prisoners on behalf of her masters. Her love of pain also makes her a difficult fight. 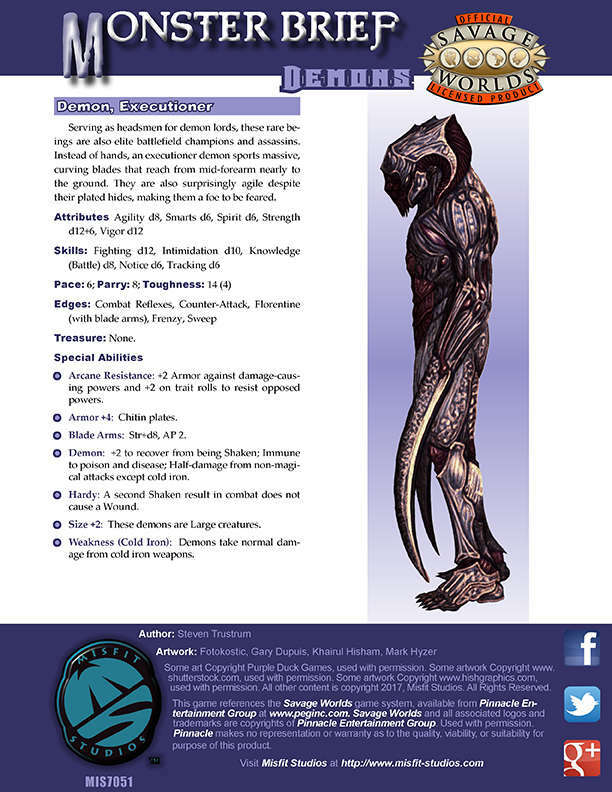 This game references the Savage Worlds game system, available from Pinnacle Entertainment Group at www.peginc.com. Savage Worlds and all associated logos and trademarks are copyrights of Pinnacle Entertainment Group. Used with permission. Pinnacle makes no representation or warranty as to the quality, viability, or suitability for purpose of this product. Both a color and print-friendly version of the product are included. This title was added to our catalog on April 11, 2017.